The murder of Lieutenant Ummer Fayaz (2RajRif) in May and the public killing of the Deputy Superintendent of Police Mohammad Ayub Pandit outside the main Srinagar mosque, Jamia Masjid, on late June 22 evening that Mirwaiz Umar Farooq did not even see fit to mention in his Eid festivities-related address, could constitute something of a turning point in the affairs of Kashmir. With the Muslim society of the Srinagar Valley now cannibalizing itself, it is the right time for the Indian government to embark on a far-reaching policy to finish off the separatists once and for all. If Fayaz’s murder wasn’t, the lynching of Ayub could be the polarizing event that compels the Valley folks to take sides. The heart-wrenching scenes of the DSP’s relatives defiantly proclaiming their Indian-ness and challenging the extremists to do their worst is just the sort of thing needed to turn the people against the militants, and to collar them as well as the larger problem of separatism. This is how it can be done. J&K Police have been for a while now chafing at the bit, demanding to be allowed to respond to the violent provocations of the separatist/extremist elements with force. This is significant. J&k Police comprises people from the Valley, of persons living in the lanes and mohallas of large towns — Srinagar, Baramulla, Anantnag, etc — as Aub did, not a stone’s throw away from the Jamia masjid, where he met his bloody end. The specialist counter-terrorist force in the JKP is the Special Operations Group (SOG) which is made up of motivated manpower from the JKP, who flow with the Valley social slipstream and can generate solid intelligence regarding militants and their wellwishers active in the towns and the countryside. SOG combining with the JKP forces should now be given the license to do whatever is necessary to end the separatist movement. Chief Minister Mehbooba Mufti has hinted at this. The JK government should now show steel and proceed with this line of action. SOG will not require any outside prompting and will prosecute actions. They should be encouraged to show no mercy whatsoever to the militants, miscreants, and their supporters. A KPS Gill like cleansing of the Valley society is now in order, and Mehbooba should order it. with Delhi’s support. The army’s role in the operation will not be insignificant. Like rats scurrying out of harm’s way, the Ayub killers are trying desperately to get the hell out. Between the army and the JKP, they should be able to get hold of these vermin, even as SOG — acting as the Punjab Police Commando did in Punjab against the Khalistan-boosters — goes about physically eliminating the militants and Lashkar and Jaish members, ex-Pakistan. Army’s Srinagar-based XV Corps has its role etched out. Indeed, it is a pity that the institutionalized habit of an officer appointed to a new post insisting on doing things his way by undoing/disregarding whatever his predecessor did even if it fetched results has so taken root, it is hurting the national interest and undermining security. Thus, the approach and innovative methods adopted by Lieutenant General Syed Ata Hasnain as XV Corps commander, 2010-2012, were lost almost immediately after he moved to Army HQrs as Military Secretary. 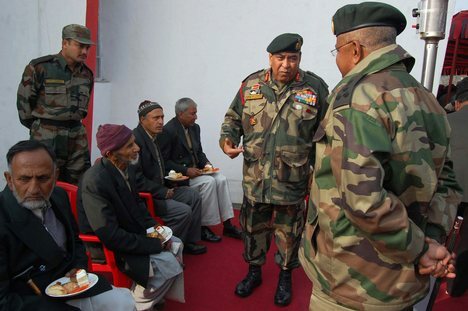 Some blame the bad blood between Gen VK Singh, who was long involved in Kashmir ops ( as commander of the Victor Force) and had supported Hasnain’s efforts from the time the latter commanded the 12th Infantry Brigade, and his successor, Bikram Singh, who brought in Hasnain as his Milsec, for this discontinuity. It is such small and petty inter-personal frictions that also derail the army. In any case, what is it that Hasnain did that was worthy of the army making it a permanent template for XV Corps’ internal security operations? Firstly, Hasnain (Garhwal Rifles) — a khandani fauji, his father was the late Major General Syed Mahdi Hasnain — instituted the periodic durbars, the “awami sunwayees”, wherein the locals would publicly air their complaints and, as Corps commander, Hasnain would just as publicly, try to deal with these and otherwise resolve their everyday problems on the spot. The Valley Muslims had never experienced such a cordial relationship with the army, and very soon developed an intimacy that helped Hasnain’s other prong — using the army, SOG, and intelligence –IB/RAW to go after cross-LOC militants and Lashkar/Jaish leaders who had infiltrated the Valley society, to work. What was significant was that all these agencies cooperated to eliminate, and this is important, ONE militant leader at a time. Why was this “one at a time”-rule imposed by Hasnain important? Because it focused the minds and the efforts of all those involved wonderfully well, and cut down on the usual mad scramble of each unit acting on its own, obtaining in the aggregate a welter of haphazard efforts involving too many targets, and achieving nothing very much as a result. This, alas, is the case now. The Hasnain methodology evidenced the smooth working of the classical “hearts and mind” strategy in a counterinsurgency situation, except it lasted only as long as Hasnain’s posting in Srinagar. And that’s the pity. The pity is that the Indian armed services are so centered on the unit commander of the moment that any good the previous incumbent may have done is, as mentioned earlier, swept away as detritus by the new incoming head. This pattern is replicated at all levels right up to the top. At the highest armed services’ level, this has meant chief of staff-centred armed services, a liability the Indian government over the last nearly 70 years has done nothing to tackle. Such ridiculously counterproductive and wasteful approach in the military needs immediate correction. A simple directive that no new chief of staff can trash, overturn, or negate any ongoing approaches, solutions, programs, and procurement priorities without first clearing it with MOD would have a salutary effect. This order can be appropriately configured for application at all levels of the armed forces, just so ongoing fruitful activity is not disrupted. This is a longstanding necessity, but something so commonsensical has been studiously ignored. Indeed, military does not even think of it as problem. Then again, in the prevailing Indian system, common sense may be as alien to the Indian armed services as it is to the Indian government. True, Gen. Hasnain was fortuitously placed to carry out his strategy, not least because he is a Muslim steeped in the subcontinental Islamic culture, and could pick up easily on cultural nuances and empathize with the Valley Muslims. This no doubt helped him to eradicate their fears while stoking their optimism and hope. There’s no dearth of motivated Muslim officers in the Indian Army. Could the Army HQrs, perhaps, do some career management, and begin grooming the best among them for longtime posting in Kashmir as Hasnain enjoyed, in his case, by sheer luck and happenstance? This will take care of the continuity problem. For a start, a formal revival of the two-pronged Hasnain strategy is in order. If the army has no institutional memory of it, the COAS Gen Bipin Rawat, could call on General Hasnain — a Delhi resident — to help out. He could be specially commissioned to reestablish the modalities of the “awami sunwayees” and the army-SOG-JK forces-intel interfaces, so the army — and especially XV Corps, can get going independent of the politically floundering PDP-BJP government, which may be too constrained openly to help. But a third prong should be added to make the Hasnain strategy still more effective. And that is the cultivation of the Liaqat-Kukka Parey option that I have long advocated in my writings. Yes, Liaqat grew a little too big for his boots and began hurting the locals’ interests, and Parey joined the political mainstream and was killed by the militants. But the groundswell against the Fayaz and Pandit murders should point out the more angry among the lot who are bent on vengeance. Like the young Jat Sikh lads Gill recruited to hunt down and rid the Punjab landscape of the Khalistani villains, young Kashmiris who feel done in and victimised by the militants should be helped in every way possible with training and other resources to be the irregular arm of the army and assisted to “do the dirty work”, and a well-oiled scheme for rewarding those showing initiative in this respect embedded with the GOC, XV Corps. The Indian republic has been too lenient in the last 70 years with terrorists, militants, insurgents, Maoists, and ruffians of this ilk. How long does the Union have to suffer them? The time to act is now. This entry was posted in Asian geopolitics, civil-military relations, Culture, Decision-making, domestic politics, Geopolitics, Great Power imperatives, guerilla warfare, India's China Policy, India's Pakistan Policy, India's strategic thinking and policy, Indian Air Force, Indian Army, Indian democracy, Indian ecobomic situation, Indian Navy, Indian para-military forces, Indian Politics, Internal Security, MEA/foreign policy, Military/military advice, Pakistan, SAARC, society, South Asia, Special Forces, Terrorism. Bookmark the permalink. A three pronged strategy worth giving a try in Kashmir,since nothing else seems to be working anyways.Lt.General Hasnains’ awami sunwayees’ and the one militant at a time approach,with a concentrated and cooperative approach by all agencies seems to be a classic ‘iron fist in a velvet glove approach’ something very much needed now that the atmosphere is so vitiated in the valley that locals are at fellow Kashmiri cops throats.The kukka parrey type option is worth trying again since it worked pretty well in the past. Just to add to the three pronged strategy,one feels that a stint of Governors rule(with a Jagmohan type Governor at the helm)would also go a long way in snuffing out the current unrest in the valley.This would at once untie the hands of JKP & SOG,who can then get to work in right earnest,without political monkeys on their back.With CM Mufti advising JKP to adopt a soft approach inspite of the gravest provocation theres no point in having a coalition govt in consort with the PDP thats always advocated’ soft separatism'(whatever the hell that means).Having this party in the state government only seems to embolden the militants,sooner this experiment ends the better it would be for the men in uniform. I think Army is one of the instruments of the State. Kashmir needs an iron fist (advocated even by late KPS Gill). This needs a political will as much army actions. The current strategy of declaring 250+ terrorists by name as targets , backed by extremely tough action on LoC is the right one. We need to activate the State police for Law and order. They need to be on forefront of handling terrorists and stone peters/sympathisers . The bureaucrats of the state have let it down badly too. Not able to utilise thousands of crores given by the Central,government. We need to put murderers like Yasim Mallik behind bars and throw away the keys. Then to bring in development , activate village Pamchayats. This is a tough one, given terrorists have gunned down village pramukhs. Your tough stand on such anti social elements is welcome ! 250+ terrorists were never named as targets. That is simply the number that the current govt. believes are holed up in Kashmir. Earlier the number used to be 400 and so on and so forth.